Many people consider a stainless steel countertop to be plain looking, sterile, and industrial, which makes many people shy away from using a stainless steel countertop in their home. Although a stainless steel countertop is one of the most durable and easily maintained countertop types in existence, because they are seen by many people to be unattractive they are not as popular as other types of countertops for placement in the home. There are many different ways that can be used to make a stainless steel countertop an attractive and unique addition to your home and the benefits of having a stainless steel countertop in the kitchen area will make themselves apparent very quickly. One thing that many people do not know about stainless steel countertops is that they can be purchased from the manufacturer with a design created in the countertop. 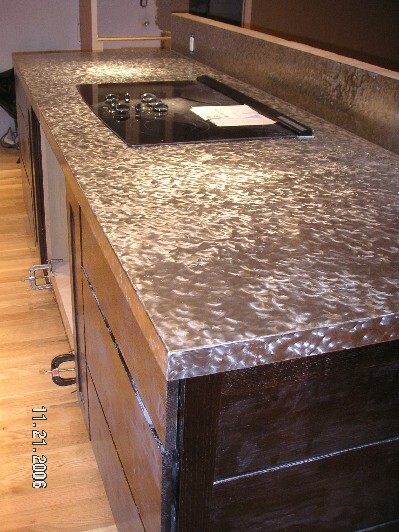 This breaks up the monotony of the plain, shiny gray of the stainless steel and gives the countertop a designers touch. Different patterns are available from different manufacturers so it is important that the homeowner shops several different manufacturers to see the options that are available before making their final choice. One of the most common patterns chosen for a stainless steel countertop is the burnished look, where the color of the countertop ranges from dark to light in undulating waves across the countertop. Another style that is commonly used is the stainless steel countertop with straight lines etched into the surface to resemble a tiled countertop. Fanciful designs and asymmetric swirls can also be incorporated into the design of the stainless steel countertop to make the countertop look more attractive and unique. The design that is created within the stainless steel countertop can be used to enhance the décor of the entire kitchen area. It will add a splash of contrast to a plainly painted room and provide a pattern to focus on in a room that is otherwise flat in color or texture. The pattern of the stainless steel countertop may also be perceived as dramatic depending on the colors and styles of other items located throughout the kitchen area. When bold or bright colors are used near a stainless steel countertop, the countertop captures the color and reflects it back, effectively changing the appearance of the countertop. A countertop that has bright yellow walls and golden oak cabinets located around it will appear to have a golden sheen when viewed from a distance because of the yellow reflecting off of the countertop surface. Kitchens that are painted blue will give the stainless steel countertop a blue glint, helping it to blend better with the existing décor of the room. Stainless steel countertops are very versatile when it comes to being used as a décor item and with a little careful thought, the homeowner will be able to think of a way that makes the countertop unique and attractive in their home.